Borussia Dortmund restored their six-point lead at the top of the Bundesliga table after defeating RB Leipzig 1-0 away at the Red Bull Arena. Axel Witsel's 19th-minute strike proved to be the winner for Die Schwarzgelben, who also struck the woodwork in injury-time, as Die Bullen were condemned to their first league defeat of the season at home. The hosts started on the front foot and initially pegged their opponents back into their own half in the early stages of the first period, with Timo Werner causing havoc for Łukasz Piszczek on the left flank but unable to provide any end product in the final third. Having fallen behind, Die Roten Bullen started the second half in similar fashion to the first, committing men forward and getting into some promising positions out wide, but couldn't properly test Roman Bürki, who looked relatively comfortable for the most part in the Dortmund goal. However, the longer the game the progressed with just a goal between the two sides, the hosts grew in belief and created a host of decent chances, with their best headed wide by substitute Matheus Cunha as the home side suffered their first home league defeat of the campaign. Starting XI: Gulácsi (5); Klostermann (5), Konaté (6), Upamecano (5), Halstenberg (5); Sabitzer (5), Demme (5), Kampl (5), Laimer (5); Poulsen (5), Werner (6*). Substitutes: Cunha (5), Jean-Kévin Augustin (N/A). STAR MAN - Werner gave the experienced Piszczek a torrid time during the game. His movement in the first half saw the Pole resort to fouling the striker on several occasions and, with a lack of service, he was left to fend for himself against the full back and co. He got into some promising positions but instead of being in the area for his side he was forced to be the provider, leaving his side without an option in the box, through no fault of his own. He also tracked back to prevent his side from going 2-0 behind deep into injury-time. WORST PLAYER - Yussuf Poulsen didn't really affect the game in many ways, in fact he offended the referee more than the Dortmund defence. He was deprived of service in truth, but instead of looking to help his side get a result he was more interested in getting opposition players booked. He picked up a booking himself, for dissent in the 90th minute. After a nervy start, the visitors grew into the game and started to look like their regular selves, passing with more intent and tempo and getting the ball out wide, where Jadon Sancho and Raphaël Guerreiro looked to threaten. The Portuguese sent in some dangerous deliveries with his wand of a left foot and in the 19th minute his corner eventually fell to Witsel, who rifled home before Abdou Diallo headed wide from another Guerreiro set piece. 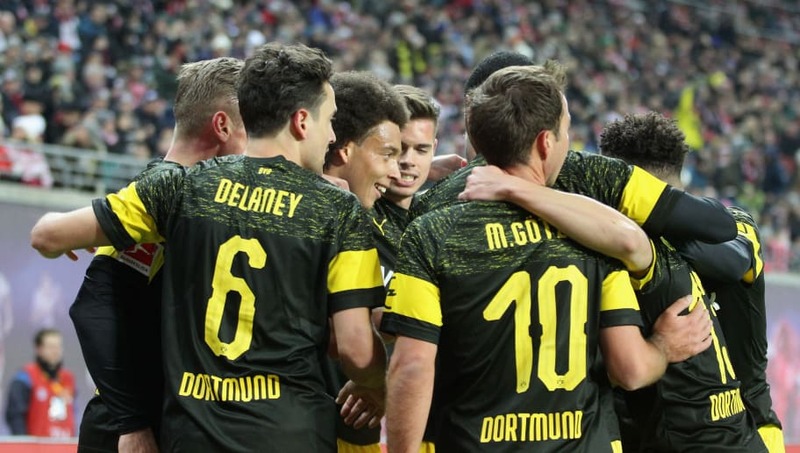 With ​Dortmund in control, Lucien Favre's men looked to seize their opportunity on the break in the second half, with Sancho and Maximilian Philipp baring down on goal, but both were wasteful and squandered the immediate opportunity to bring the contest to an end. Substitute Paco Alcácer was introduced to seal the victory, but the Spaniard was to be denied by the woodwork, although Die Schwarzgelben held on for all three points. Starting XI: Bürki (6); Piszczek (5), Weigl (5), Diallo (5), Hakimi (5); Witsel (7*), Delaney (6); Sancho (6), Philipp (5), Guerreiro (6); Götze (6). Substitutes: Pulisic (5); Wolf (N/A), Alcácer (5). STAR MAN - Witsel's goal proved to be the decisive winner for the side. He used his experience to control the game for Favre's men, showing some nice touches in midfield throughout the game and also did his fair share of defensive work. He broke up play with tactical fouls, put in some vital challenges and also made a key goal-saving block in the first half. WORST PLAYER - Philipp may have earned himself a rare start for Dortmund in the absence of ​Marco Reus, but he didn't take his opportunity for the side. He was given a few chances at goal but squandered them. He did well to get in behind the Leipzig defenders, but lacked the pace to bare down on goal and was crowded out on a few occasions. It was disappointing for a player, who hadn't started a league game since October. Next up for Leipzig is a trip to 13th placed Fortuna Düsseldorf, who have won their last four league matches. Meanwhile, Dortmund host 17th placed Hannover 96, who haven't won in the league since their 2-1 victory over Wolfsburg in November, a run of seven Bundesliga matches.